The Gulf of TigulIio and Portofino are situated on it’s eastern half, the Riviera di Levante, is defined by its rugged cliffs, turquoise coves and pastel seaside towns, including the Cinque Terre fishing villages and Santa Margherita Ligure. Portofino – with all hotels close to the beach and the elegant harbour – is perfect as an elegant Italian wedding destination. The small seaside town has been a popular vacation destination for the rich and famous for more than 150 years featuring designer stores and elegant restaurants. 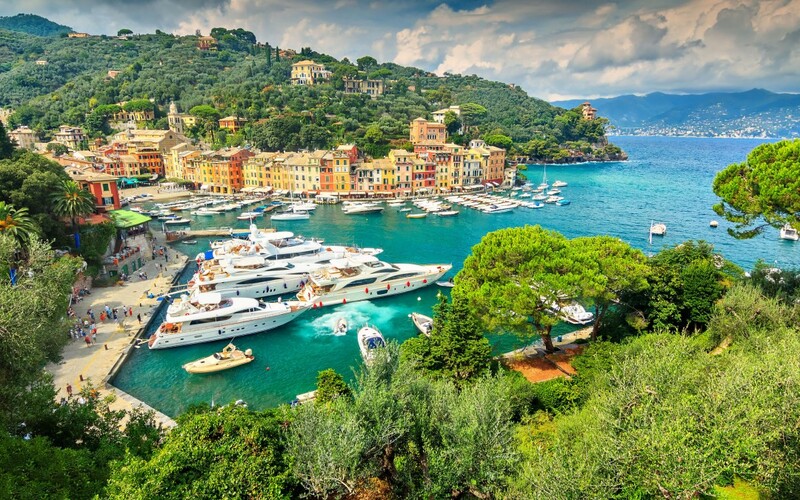 Portofino is a truly photogenic destination, with beautiful views whichever way you look. Your wedding guests can enjoy the area’s leisurely lifestyle, while indulging in its excellent local wines and seafood dishes. Portofino’s moderate climate makes it a pleasure to visit at any time of the year, but to guarantee the perfect Italian summer weather for your Portofino wedding, choose the Summer months of July and August. Visiting in Summer gives you the opportunity to enjoy the village’s carnival and festival events, as well as taking advantage of the yachting season. Like most of Italy, these Summer months can be extremely hot and humid, with temperatures averaging 30°C. Spring and Autumn, however, can be just as beautiful for weddings, giving you pleasant evenings and cool breezes, but without the heat of the day. Once you have chosen the area as your wedding destination, select wedding venues on the famous Tigullio Gulf and Portofino that range from elegant or rustic locations to lavish palaces and luxury yachts. If you’ve always wanted an outdoor wedding an elegant hotel with an Italian garden and a breathtaking view, suspended between the intense blue of the sea and the green mountains.or harbour at sunset, or pick the tranquil surroundings of a local vineyard. The sumptuous interiors of castles and villas provide an beautiful indoor location for unforgettable weddings on the Tigullio Gulf. Why plan a wedding in Portofino? Portofino has so much to offer as a wedding destination, with its perfect climate to its stunning scenery and range of wedding venues that leave you spoilt for choice.